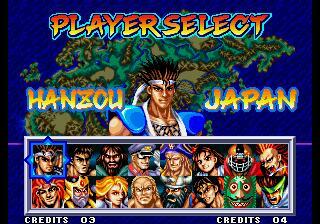 STORY: The tournament to decide the strongest warrior in history is about to unfold in for five days... 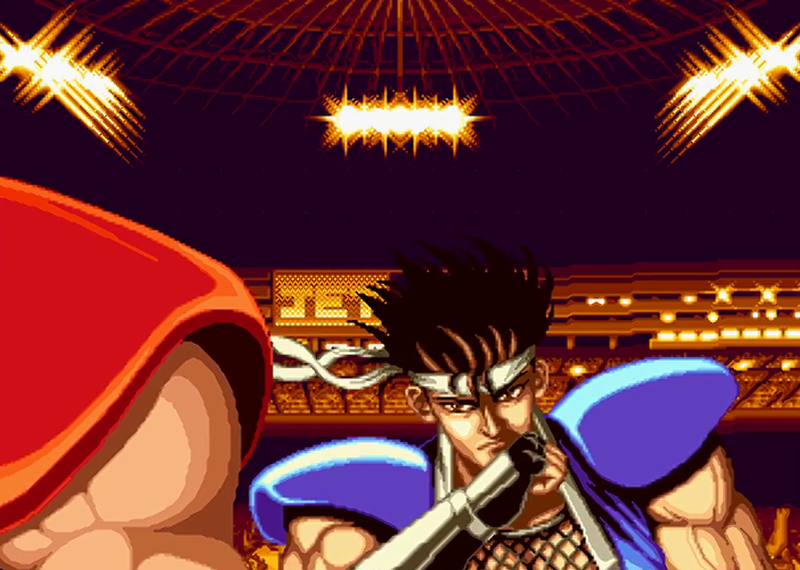 However, a behind the tournament's scenes lies a dark shadow. 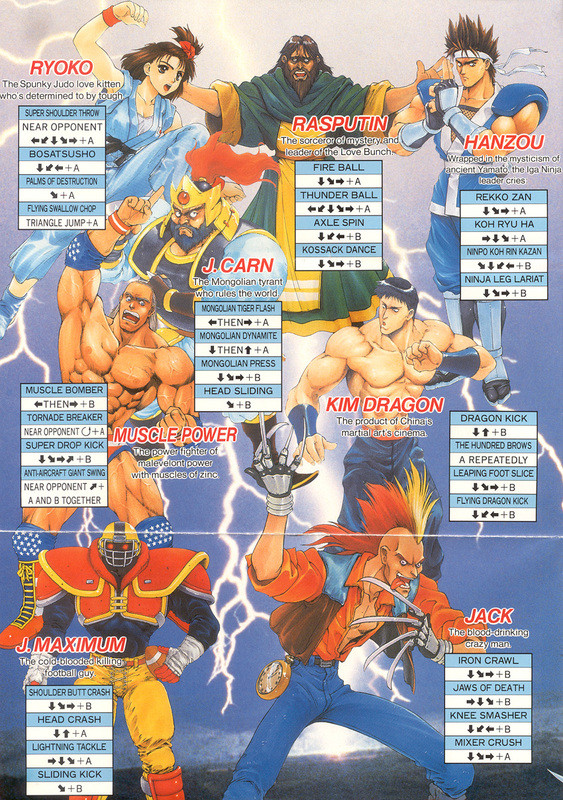 The heroes involved in the tournament remain unaware of its involvement. Just who is the one responsible for these tournaments? And who is the true identity of the person lurking in the shadows? The Heroes Battle continues!! 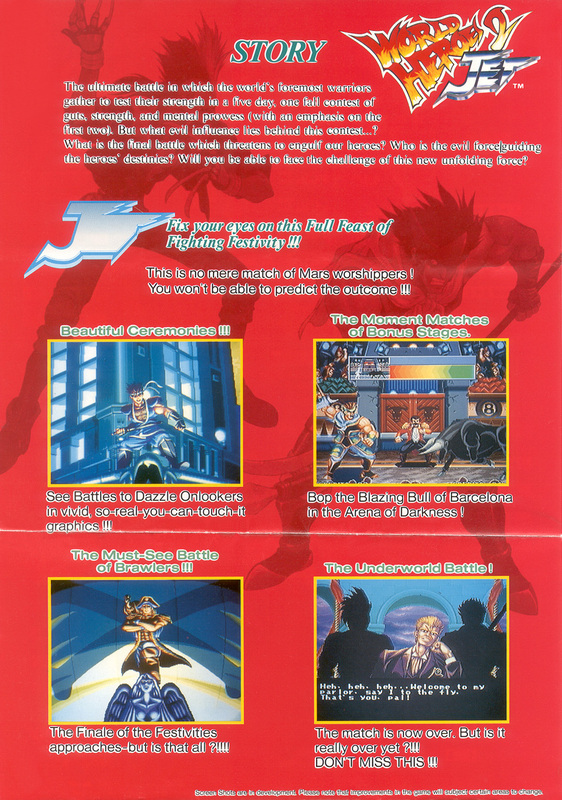 Will you be the last one standing!? 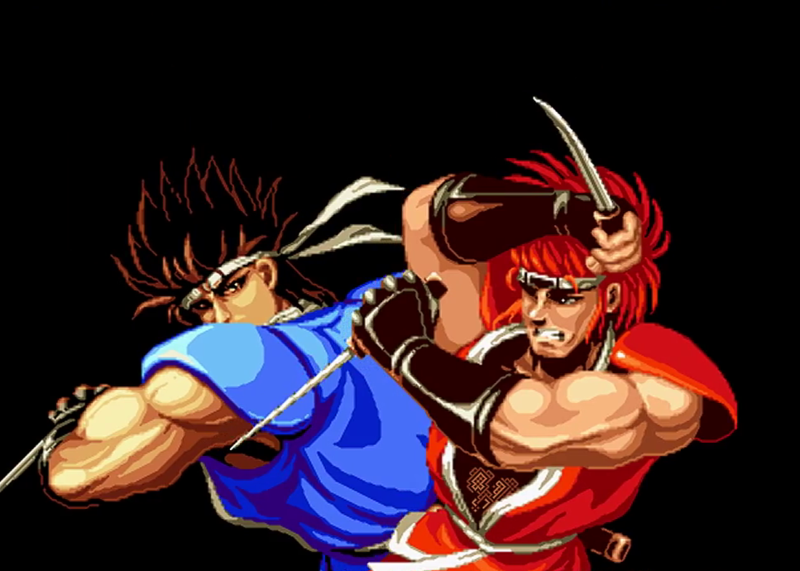 REVIEW: The third installment of the series, World Heroes 2 Jet introduces two new selectable fighters: Jack & Ryofu. 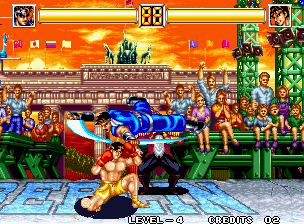 Additionally, a brand new final boss, Zues, awaits players at the end of arcade mode. 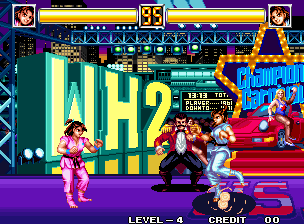 As you can tell from the screenshots above and below, the game features new character artwork and stages, but the returning character sprites remain the same. 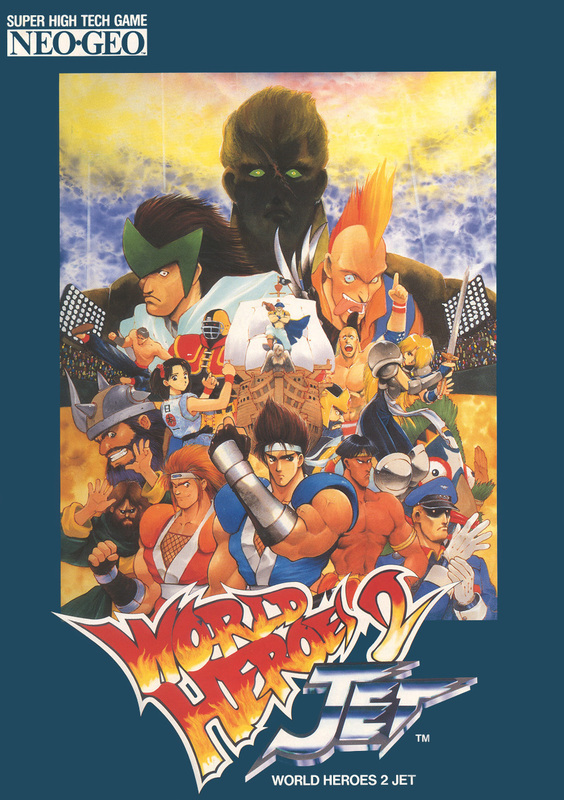 Worth mentioning, art style in World Heroes 2 Jet's promotional artwork is definitely an improvement over the prequels. 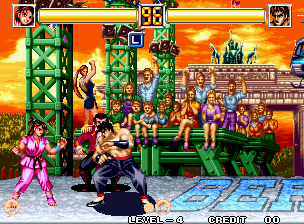 The "USA stage" is a must in any 90s fighting game. lol. 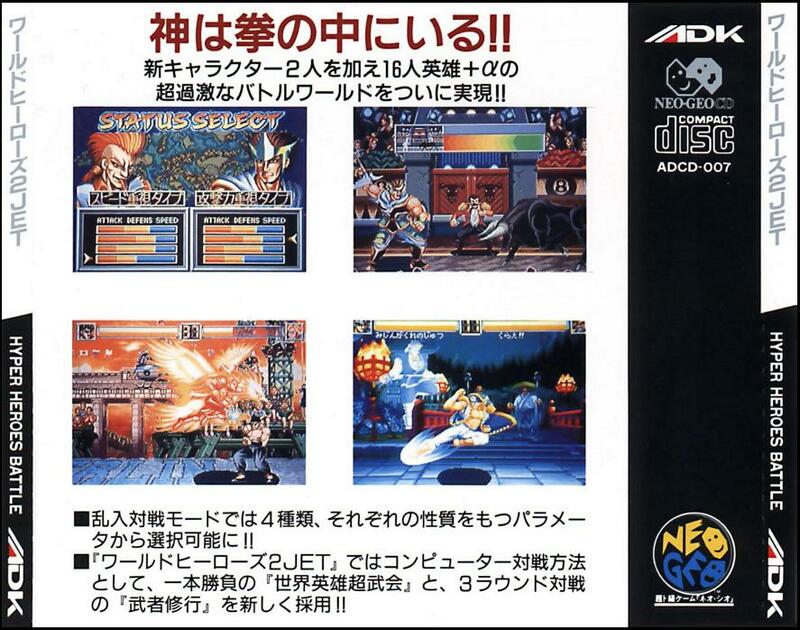 One of the most notable gameplay changes in World Heroes Jet is the speed. 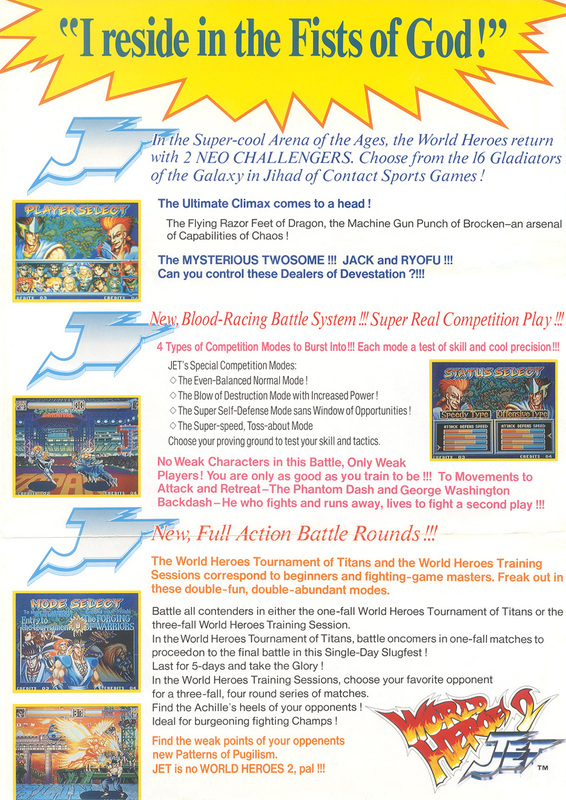 Previously, the World Heroes series was known for its slow (and kinda clunky) gameplay. 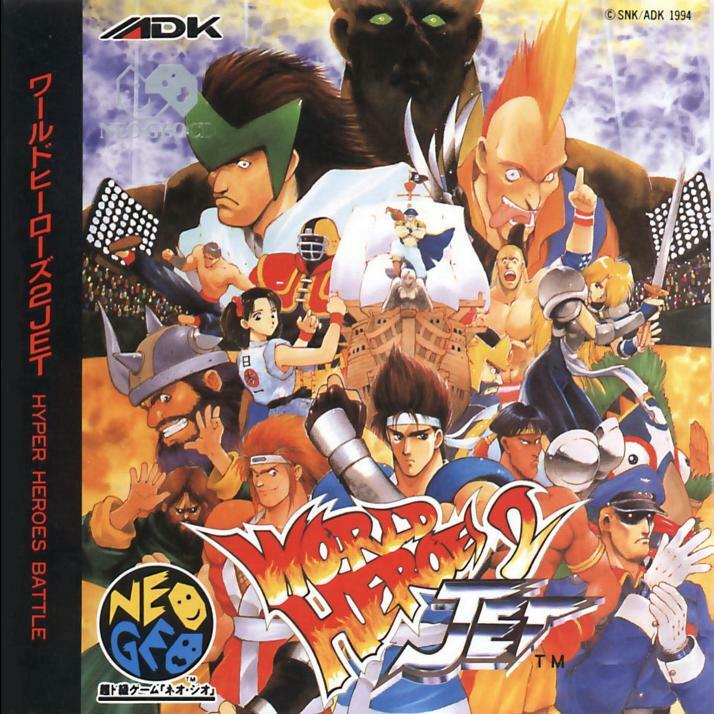 That said, World Heroes Jet is definitely the best of the series to date when it comes to the feel of the gameplay, but the game still doesn't offer much in the way of "unique" to the fighting genre at the end of the day. 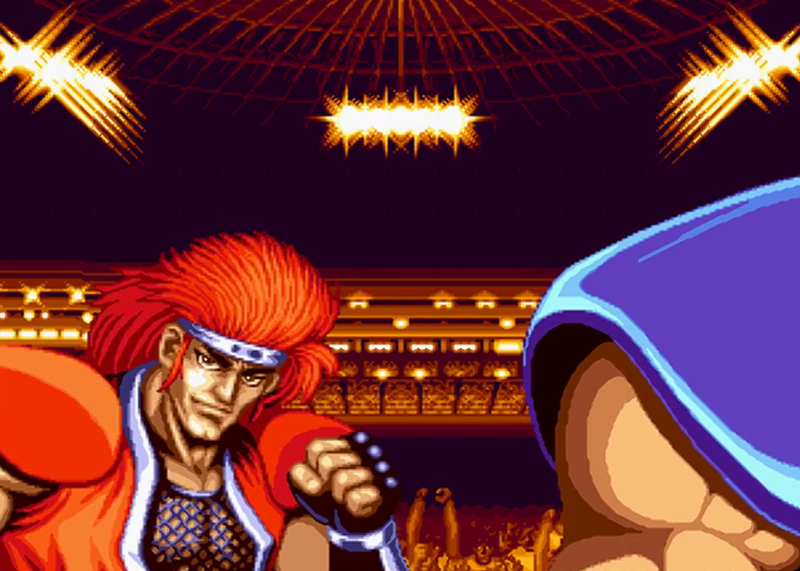 The 2 new characters and slight gameplay adjustments aren't quite enough to bring the World Heroes series up to speed with the top fighting games of the time. 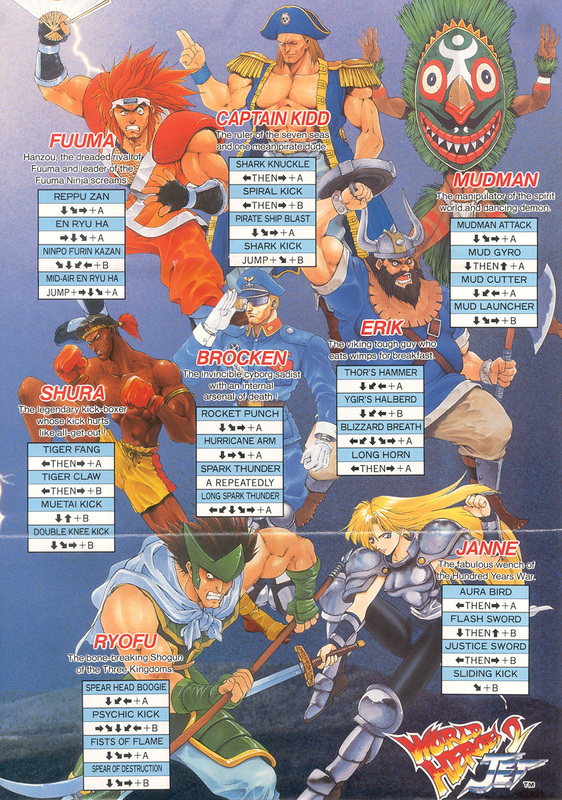 In my opinion, WH2 Jet just feels kinda old and played out after playing many other fighting games of the era. 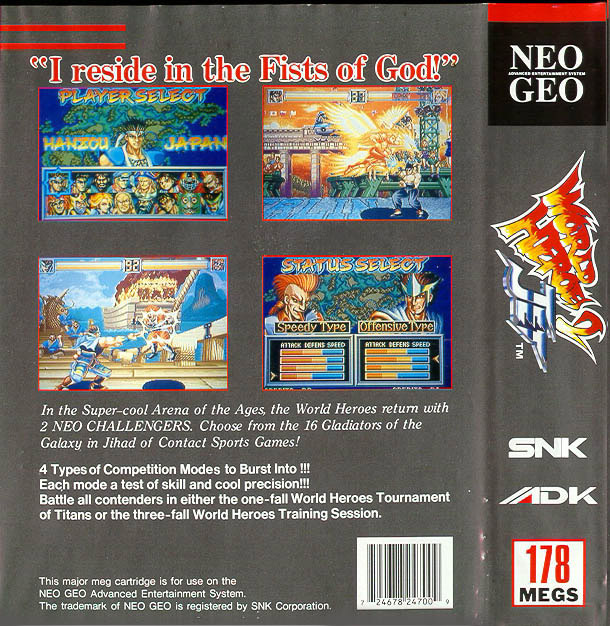 Is that a wannabe Shoryuken I see? 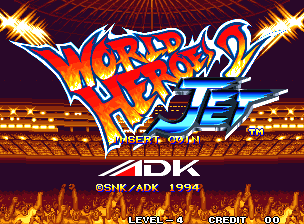 On the bright side, World Heroes 2 Jet is definitely best-looking title of the series to date, with colorful new backgrounds and new character artwork (in-game and on promotional posters / cover art). 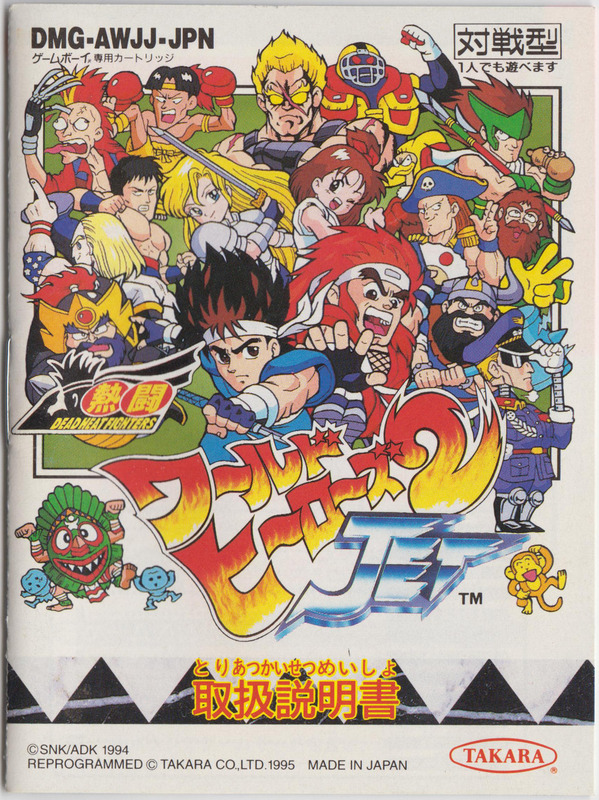 Returning characters were given a couple new moves, animations, and pre-fight introductions... which at least helped keep some of the designs fresh and entertaining. 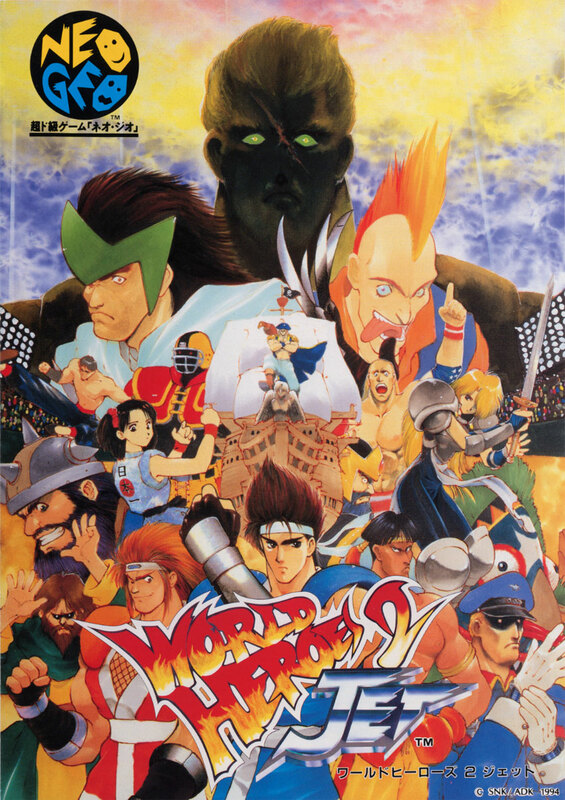 Just over a year after World Heroes 2 Jet was released, ADK released the final installment to the series: World Heroes Perfect. 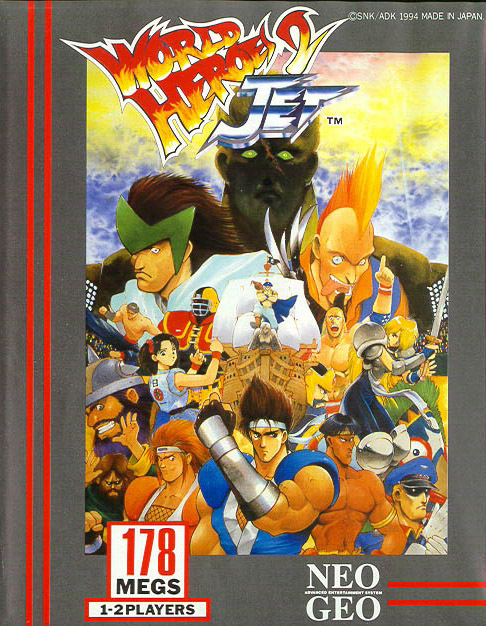 World Heroes Jet was an improvement over the prequels, but the game was still lagging behind the competition in more ways than one. 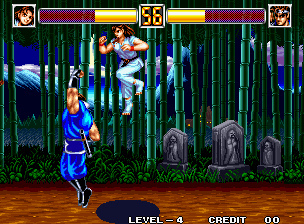 Considering the steep competition of the fighting genre in 1994, it's not difficult to see why World Heroes failed to obtain long-term success in the genre.